This weekend is Father's Day, and we are happy to bring you an amazing resource of graphics suitable for this day that will help you create some amazing slides, or anything else you want to create. Scrapbookpresentations.com is an amazing resource, and they have so many graphics available for almost any holiday or event you choose, including Father’s Day. They are now offering a bundled collection of 50 graphics for Father's Day that includes PNG embellishments you can insert straight into Microsoft PowerPoint, other Office programs such as Word and Excel, or even Apple Keynote, Prezi, and Google Slides. 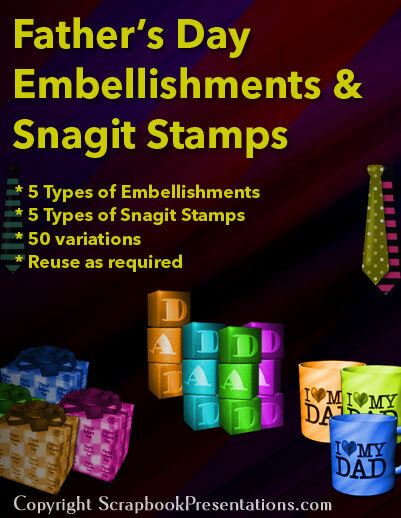 Additionally, the bundle includes the very same graphics as stamps for Techsmith Snagit. What's the cost of this collection? The cost is whatever you want to pay! Don't want to pay anything? Just type 0 (zero) in the price box, and you can download for free. However, please do not misuse this generous offer. If you can pay, make sure you provide a small token amount so that the site can continue being generous to you. Get yourself a copy now.